After the greatsuccess of Sarah McKenzie's 2017 disc, Paris in the Rain(Impulse! Records), the 31-year-old pianist, singer, and composer returns with the poignant, Secrets of My Heart. The former disc opened more opportunities for her to perform around the world in such far away places as Brazil, Korea, Japan, and also established her in the United States. Its title song became one of her signature tunes and is one of the highlights of her live shows. "Traveling was something that I really had to adjust to," McKenzie says. "In the beginning, it is very exciting. I often describe it as going into a magical world; it's stepping off reality and going into this world that's so unreal. Then you come home, and all of that activity stops. It's been a world of extremes." While embarking on her music career, being so far away from her family in Australia tore her. Sometimes, she contemplated abandoning music for the security of being with her family. "I went through a big coming-of-age process because I had to really decide how much I love this dream versus how much I love being with my family," she explains. "How much am I prepared to sacrifice for my dream as a professional musician? And is it OK to follow that dream? And is this constant traveling the dream itself? I had some poignant questions to ask myself since the release of Paris in the Rain. And that process resulted in Secrets of My Heart." For Secrets of My Heart, she reunites with noted Australian composer, arranger, and events music director, Chong Lim, who produced her first two discs – Don't Tempt Me and Close Your Eyes. "He's the guy who introduced me to Wayne Shorter's Native Dancer and Antonio Carlos Jobim's Stone Flower. We always had a great connection; he knows me inside and out," she says. Recorded in New York City, Secrets of My Heart exudes cosmopolitan flair with its lineup that includes French bassist Pierre Boussaguet and Brazilian percussionist Rogerio Bocattoalongside guitarist Dan Wilson, drummer Donald Edwards, vibraphonist Warren Wolf,tenor saxophonist Troy Roberts, and cellist Jody Redhage Ferber(all of whom based in the United States). Secrets of My Heart documents McKenzie's burgeoning brilliance interpreting 20th-century jazz standards with her penchant for crafting sterling compositions that will surely become jazz standards in the 21stcentury. McKenzie penned the lion's share of Secrets of My Heart's 12 songs. The titled track deftly articulates emotional reticence while being pulled in multiple directions with regards one's passion. Amid a lithe bossanova rhythm and orchestral accompaniment, McKenzie sings such poetic verses as "Kept in a box/Locked in a darken room/Buried beneath the places where roses bloom/Sinking so slowly/Drifting apart/Just like the secrets in my heart/Swept by the wind/Lost in the black of night/Hidden behind the sun/Denied the light/Alone in the world without a guide or chart/Just like the secrets of my heart." While she acknowledges the blue corridors of some of her lyrics, McKenzie tries to counter them with glimpses of hope. "With a lot of my songs, for some reason, I can go negative, but I always need to end them with something positive," she explains. "I don't want my songs to get too dark. In general, I think I'm an optimist. Everyone is struggling with something. And definitely in this last period, I've struggled more than I'd usually have. But you got to have positivity." Indeed, the fetching original "I Fell in Love with You," prances to an upbeat swing momentum as she conveys the seemingly inconsequential moments that occur when you fall in love with someone; the song also highlights McKenzie's succinct yet masterful piano improvisations and Wilson's beguiling guitar aside. He also accompanies McKenzie magnificently on the guitar/vocal duo "My True Love Is You," a pensive original ballad, one of two on the album. McKenzie channels the elegiac wonder of Cole Porter on her ebullient mid-tempo ballad "You and the Music," an original, which she cites as the album's anthem. On the whimsical, blues-drenched "It's All About Love," McKenzie celebrates her love for jazz by challenging herself to write eloquent vocalese lyrics inside Charlie Parker-esque bebop lines. "I love writing lyrics. I think I'm very specific with my lyrics. I like Johnny Mercer, Sammy Kahn, Irving Berlin, and Cole Porter," says McKenzie before explaining that she now begins with the melody when composing. "Initially, I wrote songs together – the lyrics and melody. But when I pulled them apart, I realisedthat my melodies weren't as strong as I thought they were in my head. I think for me, I always want to have a flow with the words or something witty; and I know how it should sound." McKenzie's favourite song on Secrets of My Heart is "TillThe End of Time," one of the two originals that explicitly betray her love for Brazilian music. She wrote the song during a stint in Rio de Janeiro, where she collaborated with musicians who played with one of her heroes – Antonio Carlos Jobim. The other strongly Brazilian-inflected original is the bossa nova, "DeNada" (also written in Brazil), which contains carefree lyrics and a sauntering piano solo from McKenzie. Even though McKenzie hailed from Melbourne and studied at Boston's Berklee College of Musicon a full scholarship, she started her career in Europe, first living in Paris,then London. And while she's absorbed great harmonic and lyric-writing knowledge from the Great American Songbook, she says that Secrets of My Heart reveals her time spent in Europe, especially from a harmonic standpoint. Her residency in Europe also afforded her the opportunity to sit around the piano with the iconic composer and arranger Michel Legrand. "His style differsfrom the classic American Songbook standards," McKenzie says. "Michel is a little bit more lyrical and French; his music is a little bit more Debussy or Ravel-influenced thanthe classic American Songbook standards. To have been able to spend time with him at the piano was one of the highlights of the year." McKenzie's mesmerisingreading of "You Must Believe in Spring" best exposes her time with Legrand on Secrets of My Heart. Her solo performance of just vocal and piano accentuates Legrand's pensive yet hopeful lyrics as well as his impressionistic harmonic language. 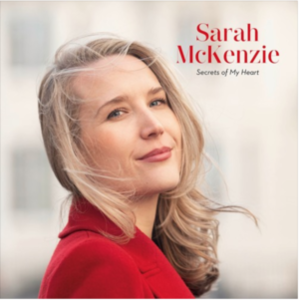 Secrets of My Heart opens with McKenzie's transfixing rendition of John Barry and Leslie Bricusse's "You Only Live Twice," which showcases McKenzie's comely piano soloing as much as it does her alluring singing. She also delivers an exquisite makeover of Stanley Styne and Donald Kahn's classic "A Beautiful Friendship" and a gutbucket take on Dinah Washington's "Come on Home." She concludes Secrets of My Heart with a tour-de-force homage to another hero, George Gershwin with "The Gershwin Medley" an instrumental on which she plays snippets of "Rhapsody in Blue," "Summertime," "The Man I Love" and "I Got Rhythm." "Ultimately, this album is about me embracing the unknown and going with love," McKenzie explains. "I'm so lucky to be able to play my music for a living."